In my last post, I took a look at the downsides of social media and its detrimental effects, such as the pressure to be perfect and the anxiety that can result. This week, I will talk about how social media can be used to start discussions about important issues such as these and challenge the stereotypes it creates. As I learned from comments on my last blog post and the class blog in general, people may be willing to share things on social media that they would be afraid to talk about in person, starting conversations that would not have happened otherwise. Social media and the Internet in general can actually be a place where people are thoughtful, honest and genuine. Two examples that demonstrate how social media can ironically be used to spread the message about some of its own problems are the videos “Look Up” and “Can We Auto-Correct Humanity?” (shown above and below). I personally discovered these videos through social media, as they were shared by friends on Facebook and went viral. Look Up is a video by British filmmaker and spoken word artist Gary Turk. It was released in April 2014 and has over 53 million views on YouTube. Can We Auto-Correct Humanity? is a video by rapper and spoken word artist Prince Ea, which was released in September 2014 and has over 13.7 million views. Both videos share some important and powerful messages. They show that social media is not as great as it is made out to be in terms of connecting people and how it has negatively impacted face-to-face interactions. Turk notes that we are “slaves to technology we’ve mastered,” as it has taken advantage of us, rather than us having control over it. Prince Ea mentions that people now have shorter attention spans than goldfish due the wealth of information and updates. Interestingly, our brains have adapted in response to this overstimulation by relying on instinct rather than critical thinking. When society emphasizes the self, rather than others, selfishness can result. Technology can contribute to feeling disconnected from others. Turk talks about how childhood has changed since he was young. He would play outside and take risks, but now children hardly go outside and instead spend time on their devices. This reminds me of the song “Cats in the Cradle,” with people unable to make time for real interactions, due to distractions and being busy, and how this can set a bad example for future generations. The point of “Look Up” is to get people to realize that they are missing out on so much of life by looking down at their phones, with the consequences potentially life changing, including conversations and the opportunity to meet new friends or a potential spouse. The video shows a man who asks a woman for directions. They begin a relationship and eventually get married and live a long life together, full of memories since they “gave life attention.” Turk then goes on to say that this relationship never occurred, since the man was looking down at at his phone. Both Turk and Prince Ea are arguing for moderation in our use of technology and social media, since it can also be used in positive ways and is here to stay. We have the ability to determine the impact it will have on us. They are also emphasizing the importance of real life experiences shared with others and being present. There is a difference between being surrounded by or connected to others and having moments of genuine human connection. Studies have shown that it is better to spend money on experiences rather than things, but it is hard to enjoy the moment if one is so caught up in capturing it to share with others on social media. Social media also has the ability challenge some of the stereotypes it creates, including the pressure of perfection and conformity, as well as address issues such as stress and anxiety. Humans of New York (HONY) is a popular account on social media that began in 2010, with over 15 million likes on Facebook and 3.9 million followers on Instagram. On these pages, photographer Brandon Stanton shares candid portraits he captures of people throughout New York City along with quotes from his conversation with them. He has also traveled to other places throughout the country and world, including the Middle East and Europe. The series has led to numerous spinoffs in other cities and for particular colleges and communities. By hearing others’ stories, we are reminded of our humanity and are able to connect with others in an authentic way. One example of a spinoff is Authentic Eagles, a series featured in The Gavel, a BC student newspaper, which started in 2014. Authentic Eagles contains articles written by students, where they are honest about their experiences and the difficulties they have faced. The purpose of this is to get people to speak up about the truth since the culture at BC may not always encourage it, with many students creating the perception that everything is okay and their life is perfect. This is in line with Jesuit ideals, including the emphasis on critical thinking and self-reflection. I personally have found them to be some of the most interesting and moving articles I read each week. They allow us to connect with people on a deeper human level, since everyone can relate in someway to many of the stories, whether it is dealing with the pressure to be perfect and successful or trying to be your own person. These difficulties can negatively effect one’s well-being and relationships with others. The stories do not dwell on the negatives, but rather how people come out of struggles stronger. By seeing other students be authentic and vulnerable, it could encourage others to do the same and begin conversations on these issues, to bring about real change. Many of these stories are shared widely by BC students on social media, which helps get the discussion started. Even though social media typically does not promote thinking about one’s actions, these various examples show that it can be used to get people to step back and question what they are doing, by bringing up issues such as mental health that typically have a stigma surrounding them. Humans of New York and Authentic Eagles help us realize that nobody is perfect, by revealing the truth. Everyone faces struggles and insecurities, and it is okay to admit imperfections. Hopefully, going forward, people will stop comparing themselves to the aspects of social media that do not represent reality, and more platforms are used to encourage authenticity. At the beginning of your blog, all I could think about is my experience whenever I go to a concert: There is always some person sitting near me that videos the entire concert on their phone without looking up once. It drives me crazy watching them waste being in the moment for a video that they will probably never watch again. By end of your article, you had me feeling like social media is headed in the right direction with reminding us of our humanity and encouraging us to live in the moment. I hope you are right… Great blog post– it had me reflecting a lot! Max, I completely agree with @nicolecasperbc here. You certainly walked your reader through the complicated relationship humanity has with social media, and, thankfully, you ended on a good note. While I was reading about Authentic Eagles, I was reminded of a program we have in the graduate student BC community called Eagle Talk. In Eagle Talk, we basically have a presentation led by a student in a program, where they talk about a difficulty they may have faced in the past, or continue to face. They are both moving and enlightening, and they’re a great way to understand the group that you are committed to studying with during the program. That being said, the internet brings this program and puts it on an entirely different scale – which might be less intimate, but equally impactful. Thanks for sharing, it was a great read! I also love the Authentic Eagles posts. It’s nice to see the BC stereotypes and expectation of perfection being broken down. I was involved with Ascend last year, which is a sophomore leadership program for undergraduate women. It was interesting that because none of us knew each other at first, we were able to share some things we would have been afraid to say to our friends. Great post – stepping back and reflecting is so important. I do think the whole SM doesn’t allow us to engage is a bit overblown. 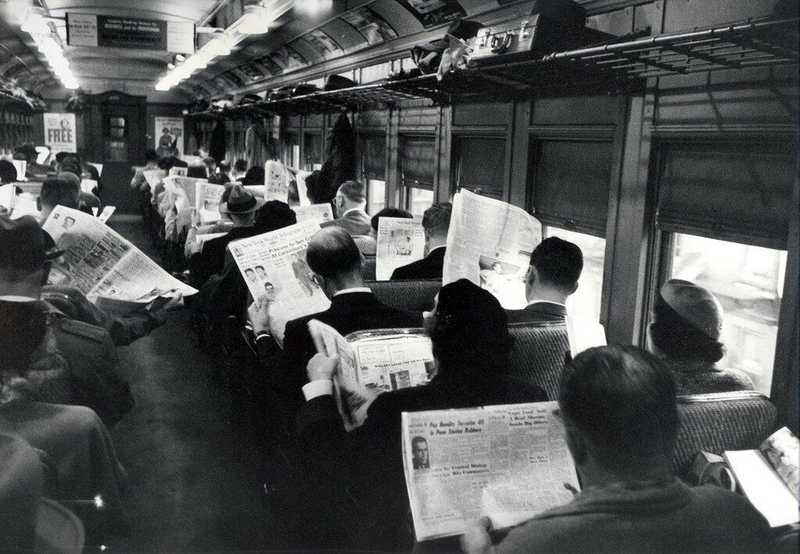 See: http://liquid-state.com/wp-content/uploads/2014/05/reading_on_train.jpg I think we have an idealized version of how “authentic” people were in the past, but TV, radio, papers all contaminated our images of who we were plenty back then too. Well, maybe except for Thoreau…. I totally agree that authentic eagles is a great example of how we can use social media in a productive way. By sharing these stories on social media we can help promote the idea that it is okay to be authentic and share your feelings. You never know if someone is having a bad day and they read one those articles it could really help them out. Sometimes that little reminder that other people are dealing with the same issues that we are makes all the difference. There is a lot of pressure on us here at BC which can sometimes be caused by social media. But we can also use social media to spread positive stories like the authentic eagles. They provide some much needed perspective to our very busy lives. I actually wrote a feature on the editors of Authentic Eagles last year (http://bcheights.com/top-story/2014/authentic-eagles-stories-faces-gavel-reflection-series/). What I found most interesting in meeting with them is that the whole concept came about from 48 Hours, BC’s freshman retreat. A retreat leader contact The Gavel about publishing several retreat talks online, and from there, this massively popular forum for students developed. From more of a marketing perspective, these posts were brilliant in how they leveraged images of students around campus to create very sharable content pieces. Research on social media shows that images of people’s face are far more likely to get likes (http://mashable.com/2014/03/21/instagram-photos-faces-more-likes/#gzNB3hspRqqY). I can also say from experience that, since “likes” are essentially endorsements—either of the message or the content itself—these pieces gained tons of engagement from people showing their support for friends who were featured. I think the past is a tad idealized BUT these were great examples of “authenticity” in an cluttered social world! I enjoy seeing ‘Humans of New York’ posts. It reminds me that huge crowds are made up of many individuals with interesting stories. Insightful post and encouraging to know that online authenticity is out there.